Rugby union is entrenched into New Zealand’s psyche and is a major part of our collective DNA. A country that can boast three separate versions of ‘The Rugby Deck of Cards’ (based on the popular 1940s hit ‘Deck Of Cards’) has to be slightly obsessed with the game and its players. Many of New Zealand’s biggest musical names have written, sung or produced songs about our national game in a host of different genres over the decades. 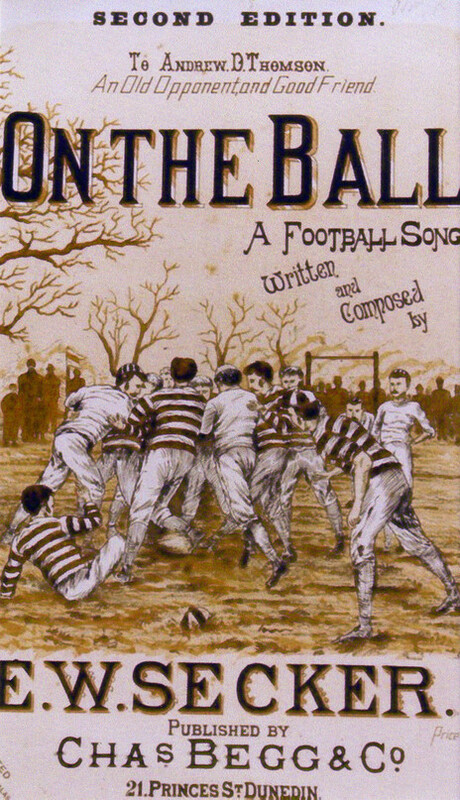 The very first local rugby song and only the second local song to be published in New Zealand was written in 1887 by English-born part-time musician Ted Secker: ‘On the Ball’. The captain of the 1887 Manawatu Unscorables, after seven consecutive losses Secker wrote the song to boost his team’s morale. During the following year it was sung by the 1888 Native Team on their tour of Britain. The 1905 “Originals” embraced the song during their tour of the British Isles and France. The song has remained popular at after-match functions since then. In 2010 Ceol Manawatu, a collective of Manawatu musicians, recorded their version of ‘On The Ball’ and released it as a digital single. On the Ball, On the Ball, On the Ball! And shout as we go ‘On the Ball’! 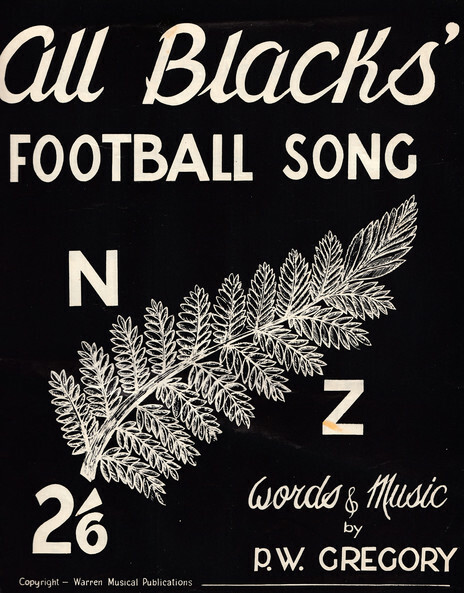 Before the recording industry found its feet in New Zealand during the 1950s, there were many rugby songs written that were published as sheet music only. One of the earliest was ‘’Welcome, All Blacks’ by HE Light and WW Boyes, published c1906. 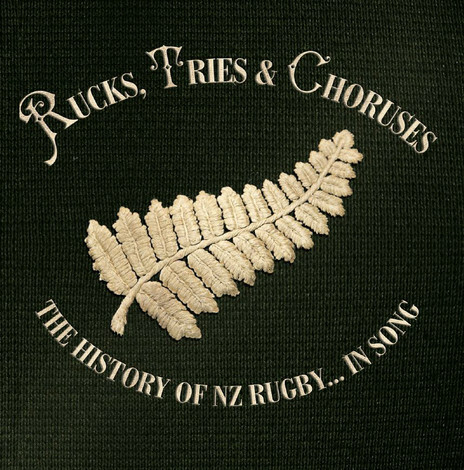 In 1924 came ‘The All Blacks (Rugby Football Boys) by Harry Hiscocks and Elizabeth Chandler; the song was subtitled “a song with a kick in it”. PW (Paul) Gregory’s ‘All Blacks’ Football Song’ appeared in 1956 and was later recorded by the Woolston Brass Band. 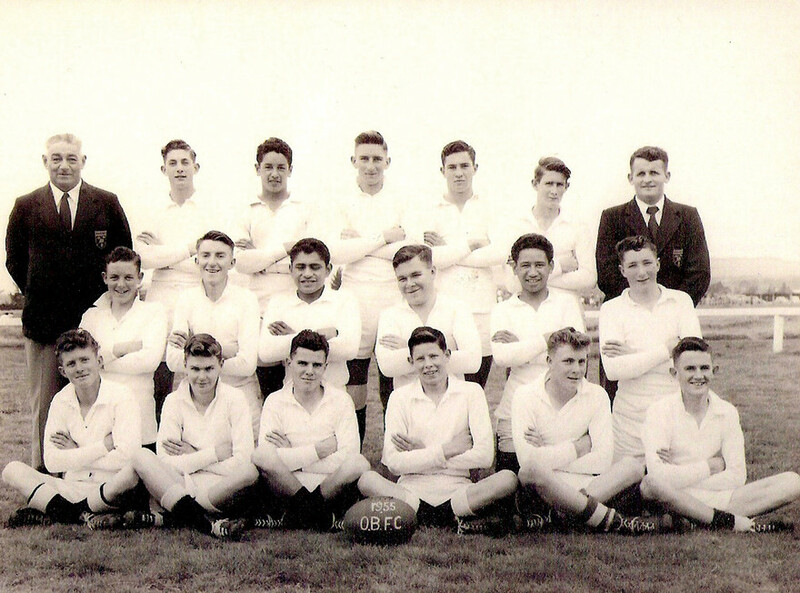 In about 1960 songwriter and jazz musician Ken Avery – of ‘Paekakariki’ and ‘Tea at Te Kuiti’ fame – co-wrote ‘The Game is Football’ with Christopher Jarman and Perce Barlow. One of the most enduring names in All Black history is George Nepia. He was selected as a fullback for the All Blacks tour to the UK in 1924-25, and he became one of the stars of the tour by playing in all 32 games. Nepia wasn’t eligible for the following year’s tour to South Africa because of their apartheid policy at the time. Nepia returned to the All Blacks for tours to Australia in 1929 and played his last test against British Lions in New Zealand in 1930. 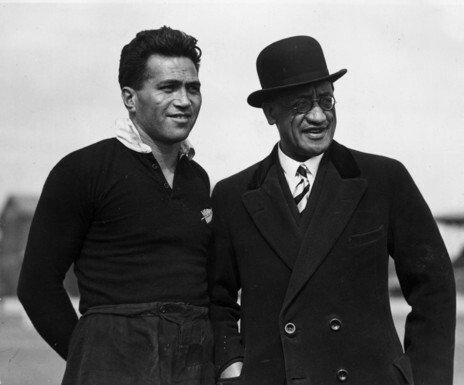 In 1935 he captained the New Zealand Maori team to Australia. The financial strains of the Depression caused him to swap codes and play rugby league in England that year for Streatham and Mitcham, for £500 (equivalent to $58,500 in 2017). It was during his sojourn in the UK that he recorded his cousin Walter Smith’s composition ‘Beneath The Maori Moon’ at London’s Decca Studios. The song was released on a 78rpm disc in 1937 as Decca F5906. In 1986, looking sprightly at 81 years of age, Nepia sang ‘Beneath The Maori Moon’ during an episode of This Is Your Life which was dedicated to him. He died later in the year. Walter Smith also wrote ‘On!! New Zealand’, which he dedicated to the 1924-25 All Blacks. It received an enthusiastic response at its premiere performance by the visiting Dixie Jubilee Singers at the Auckland Town Hall on the 5 January 1925, just two days after the All Blacks had beaten England at Twickenham 17-11. However its melody was later said to be borrowed from the US university song ‘On Wisconsin’. 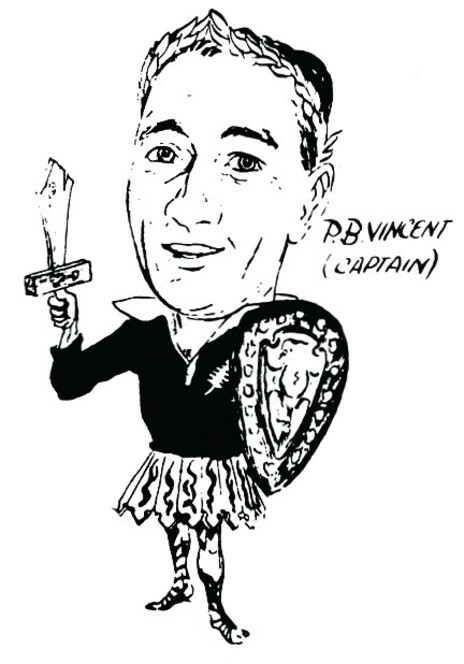 Possibly one of the biggest hospital passes in All Black history was received by Canterbury halfback Pat Vincent. Not only was he selected to make his All Black debut at age 30 against the 1956 Springbok touring team, but he was also made the Captain. The first test ended in a muddling 10-6 victory to the All Blacks. The second test with Vincent as captain resulted in an 8-3 defeat at a cold and blustery Athletic Park in Wellington. Pat was under instructions to pepper the Boks line with a kicking game in the strong southerly wind which led to one of the Boks’ tries in the low-scoring encounter. Seven changes were made to the team for the third test – including Vincent, who would never play for the All Blacks again. By all accounts Vincent was an affable person and took his dumping on the chin. He was an accomplished jazz vocalist and recorded two competent singles and an EP for Jack Urlwin’s Peak label during 1959-60. 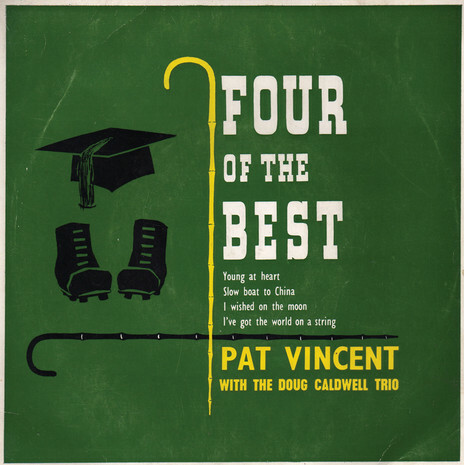 These were all recorded in Urlwin’s lounge, with a combo led by pianist Doug Caldwell. In 1967 Vincent took up a teaching/coaching job in California, and he died in 1983. 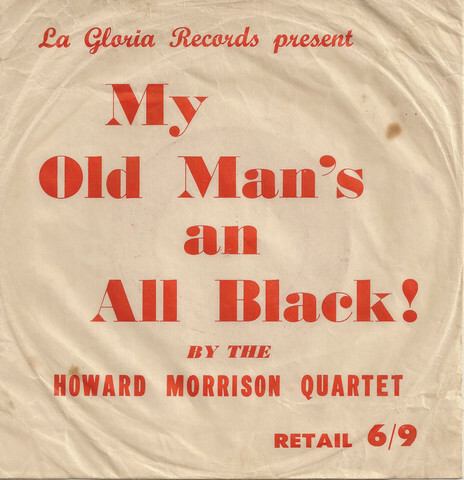 While driving to Wellington in 1960, Harry M Miller – the manager of the Howard Morrison Quartet – suggested to the group in the back of his Jaguar that it would be a good idea to record a parody song related to the imminent All Black tour to South Africa. Having already parodied Lonnie Donegan’s version of ‘The Battle of New Orleans’ as ‘The Battle of Waikato’. Miller was happy with the second take while the Quartet was embarrassed that they had to even attempt a second one. The single was reputed to have sold 60,000 copies, which lead Morrison to comment later that it was the worst recorded song in New Zealand’s history – and the most successful. In the early to mid-1960s, Westport radio station 3YZ was a home of broadcasting talent. Reon Murtha, Lloyd Scott, Peter Sinclair, Bill Toft, Ian Watkin, Bob Sutton, Warwick Burke and John Pike were just some of the announcers who either started or built their careers there. A good broadcasting team is only as good as its technical support and writers. 3YZ was lucky to have the witty producer/writer Alwyn (Hop) Owen on staff (he later founded the long-running RNZ Spectrum series). In 1960 Owen and station announcer Pike recorded ‘What is a Rugby Supporter?’ – a spoken monologue reminiscent of the newsreel shorts shown in cinemas before the main feature. 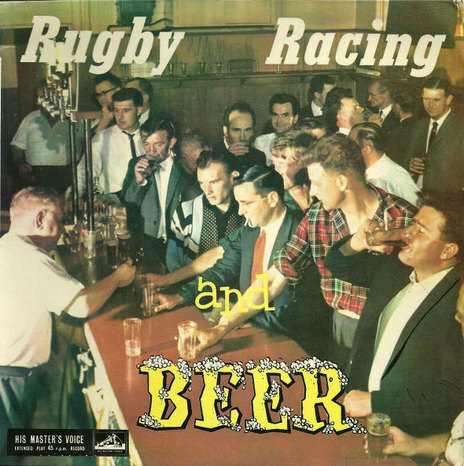 Calling themselves The Rugbymen (with the Halftimers), it was released on Kiwi, backed with ‘The Rugged Rugby Playing Trail’. 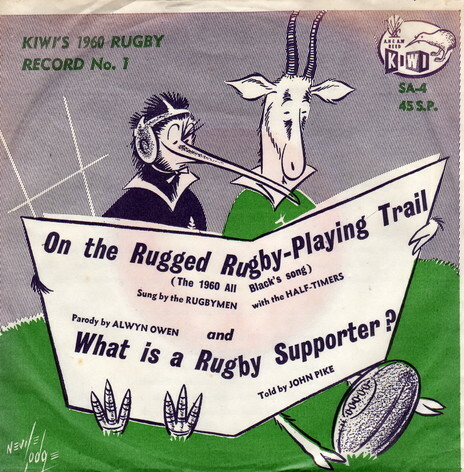 Westport broadcaster Alwyn “Hop” Owen was behind The Rugbymen’s parody ‘What is a Rugby Supporter?’, a spoken monologue voiced by John Pike and released on Kiwi in 1960. As a follow-up, Owen wrote ‘Rugby Rock’, a tale about a young rock and roll fan who becomes a rugby fan after mistaking the queue for a rugby game for a rock and roll show. He is instantly converted to rugby to the point of tearing down his Elvis pin-ups from his bedroom wall in favour of a Colin Meads poster. 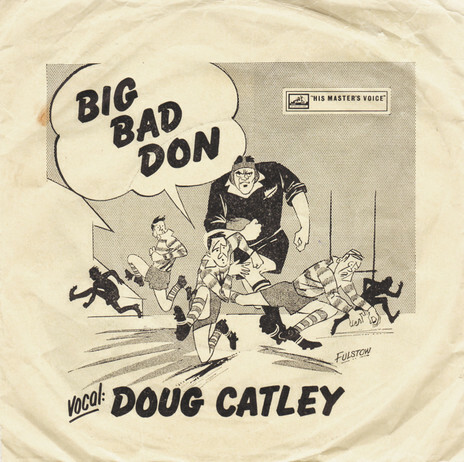 Credited to John Pike with Hop Owen and the Hop-Heads, this Kiwi 45 featured a Peter Cape comedy skit ‘The All Black Jerseys’ as the B-side. The highly anticipated 1965 Springbok tour to New Zealand was hailed as a great chance for the All Blacks to win the four-test series as revenge for the narrow series defeat during the All Blacks’ tour to the Republic during 1960. A good measure of the rugby public’s interest can be gauged by the number of songs released, both before and after the tour. HMV artist Paul Walden, backed by Garth Young’s Group, released Ernie Rouse’s ‘The All Blacks Are Ready’. On the B-side was a rousing ‘When the All Blacks Go Marching In’, replete with a strident dixieland backing. Also released on HMV at the time was Rod Derrett performing his song ‘The Springboks and the All Blacks’, accompanied by vocalists The Cambridge Trio. Even though Derrett is responsible for our unofficial national anthem ‘Rugby, Racing And Beer’, he seems rather bemused by the country’s obsession with rugby and the Springbok tour. This parody is not among his best: perhaps he had other things on his mind as ‘Puha And Pakeha’ was released a short time later. After the breakup of The Howard Morrison Quartet in early 1965, Gerry Merito embarked on a solo career. On his album I Must Have Been A Beautiful (Baby) Spaceman, Merito analysed a clash between the New Zealand Maori team and the Springboks to the tune of Johnny Cooper’s big 1955 local hit ‘One By One’. The game was played between the third and final tests with the series at 2-1 to the All Blacks. The Springboks used the game as a dress rehearsal for the final test and fielded a strong forward pack that saw the Maori scrum being pushed around the park all afternoon. To counter this the Maori team ran the ball at every opportunity and managed to keep the Boks try-less. The newspapers generally agreed that the Maori team lost the game in the forwards while Merito, with tongue in cheek, surmised in the last verse that they lost because there were “no Pakeha in the scrum”. The Welsh Rugby team visited New Zealand in 1969 and played two tests. Fergie McCormick, playing in his 12th test for the the All Blacks, kicked his way to a new world record for the most points in a test match. McCormick’s haul of 24 points included five penalty goals, three conversions and a 55-yard dropped goal. This feat was the inspiration for pop star and rugby fan Lew Pryme to extol the virtues of McCormick in song by writing ‘(The Feat of) Fantastic Fergie’, a parody to the tune of Johnny Horton’s 1960 hit ‘Sink the Bismark’. This was Lew Pryme’s last record release before starting a music management career. Over 20 years later, in the 1980s, he became the Auckland Rugby Union’s promotions manager. 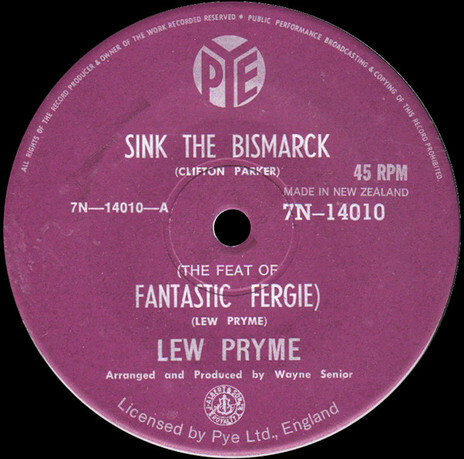 Lew Pryme's 1969 single 'The Feat of Fantastic Fergie' celebrated Fergie McCormick, a late 1960s All Black with a reliable boot. It was a parody written to the tune of ‘Sink the Bismarck’. Compared to the giddy heights of the 1950s and 60s, there was a significant drop in the number of rugby songs recorded in the ’70s. Apart from the 1970 Canterbury Rugby team and the touring 1977 Lions, among the few rugby-related songs released were country efforts by Garner Wayne. 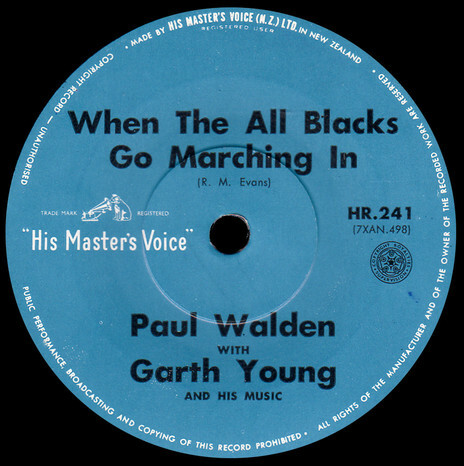 On the 1970 Viking LP Garner Wayne Rides Again the ‘Love in a Fowl House’ hitmaker released ‘All Black Hall of Fame’ and managed to namecheck 64 All Blacks from the past in his imaginary rugby museum. 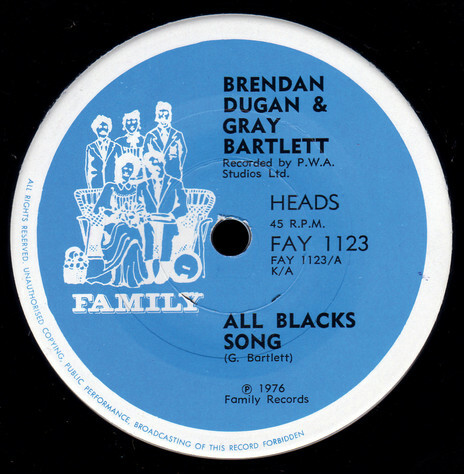 In 1976 Gray Bartlett and Brendan Dugan released ‘All Black’s Song’ to celebrate that year’s All Black tour to South Africa. The only New Zealand rugby squad to record and commercially release a song was the 1970 Canterbury side which assembled at the HMV Studios. Led by musical arranger Garth Young and producer Peter Dawkins, they recorded ‘The Name Of The Game’. Written by Wally Chamberlain, the song celebrated Canterbury’s reclaiming of the Ranfurly Shield. Unavailable for the session, because they were with the All Blacks touring South Africa, were Canterbury stalwarts Fergie McCormick, Wayne Cottrell, Alister Hopkinson and Grizz Wyllie. “Thank Christ for that,” remarked a nonplussed Wylie later. ‘The Name of the Game’ was released as HMV single HR 402 in July 1970, the same month as Hogsnort Rupert’s ‘Pretty Girl’ and Quincy Conserve’s ‘Ride The Rain’. 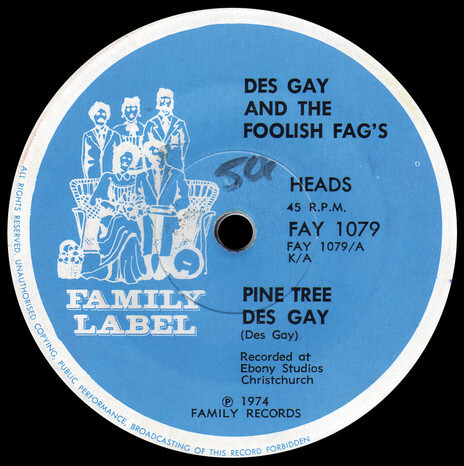 A curiosity appeared in 1974 when the pseudonym Des Gay & His Foolish Fags was used to hide the identity of a popular Christchurch breakfast DJ who recorded a one-off novelty song featuring Colin Meads called ‘Pine Tree’. The song is about an overtly gay man who wants to emulate his hero but is repulsed by the smell of liniment and doesn’t like to get his jersey dirty. Released by Family in 1974 (FAY 1079), the B-side was ‘Ballad of Des Gay’. 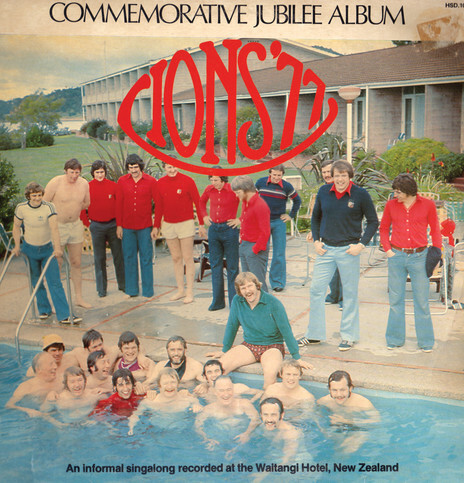 Another rugby novelty belongs to the British Lions team which toured New Zealand in 1977. A week before its three-month visit finished, the team recorded an album of singalong songs to mark the Queen’s Jubilee that year. An EMI mobile recording unit was dispatched to the Waitangi Hotel where the team were based for its game against North Auckland. The 30-man squad included 17 Welshmen, and the songs they recorded – just a week before their three-month tour finished – were as diverse as ‘Summer Holiday’ and ‘Flower of Scotland’.